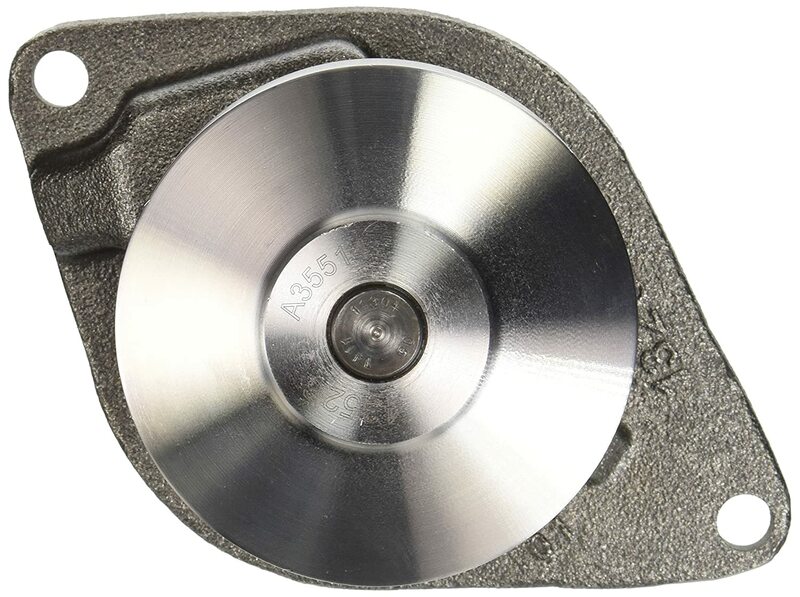 Best Water Pump for 5.9 Cummins Reviews: Top-5 in April 2019! Water Pumps for 5.9 Cummins – Buyer’s Guide! The Cummins 5.9 liters (360.0 cu in) ISB (Interact System B) uses a straight-six multi-valve pushrod engine design. The engine displaces 5,883 cubic cm (359.0 cu in), with a 102.0 mm (4.02 in) cylinder bore and 120.0 mm (4.72 in) piston stroke. This model uses a turbocharger to increase output for high-compression (17.2:1 in recent versions) diesel. The body is made of all-iron with forged steel connecting rods, an assembled camshaft, and a cast aluminum intake manifold. The 5.9 ISB connects to an electronically controlled Robert Bosch GmbH rail fuel injection, Bosch injectors, and a Bosch CP3 high-pressure pump. Now let’s take a look at the five best water pumps for the 5.9 Cummins engine. This model comes with all the mounting gaskets required for a quick and efficient replacement. This model supersedes the AP63530 model. All iron and steel components, and comes with a stamped steel impeller very similar to the original OEM design. This is a very basic model that performs as any stock component, a perfect replacement for your older Cummins models. This water pump comes with a cast iron housing and a cast steel impeller. It is a very solid product with all mounting gaskets, seals and OEM standards of performance. This product is used on all 2003-2007 5.9L ISB models. 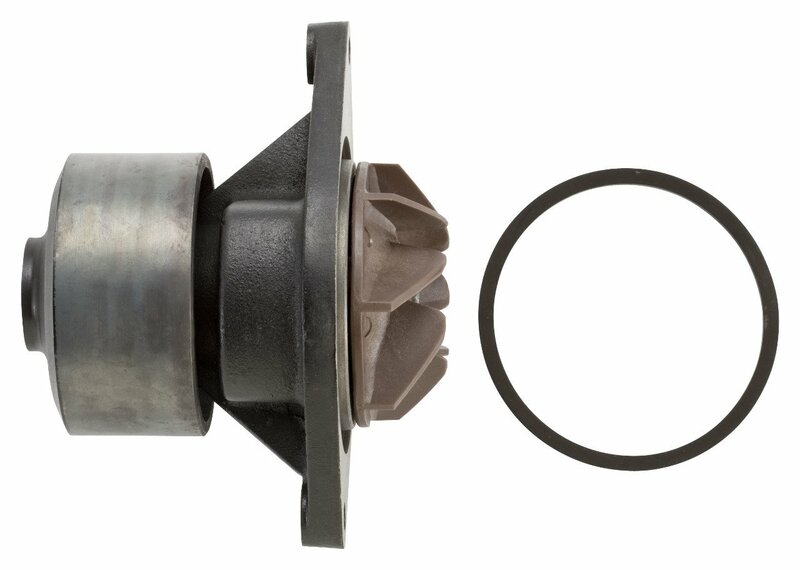 A classic quality replacement part for your worn out OEM water pump. The Gates® water pumps are fabricated using the cast iron body with a stamped steel impeller. All these pumps are made to OE standards and are easy to install and maintain. The core materials provide you with a low maintenance lifetime of performance. The cast iron housing and stamped steel impeller come with all seals and gaskets tested for integrity. This is a very versatile model, is made of premium stock materials and is a great replacement part. 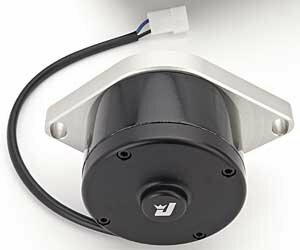 This is the JEGS Performance Products 50935 Electric Billet Water Pump that is designed for 1994-2007. This is the expensive upmarket CNC-machined billet 6061 aluminum housed electric pump unit that delivers an impressive 50 GPM flow rate. This model is made entirely out of aluminum for corrosion free service and light weight but enforced through stainless steel inner jacket performance. This is a performance product and is designed for heavy-duty engine applications; its price is nearly double that of a standard OEM water pump, so only buy this if you need to complement any aftermarket upgrades that demand a faster and more efficient flow of water. 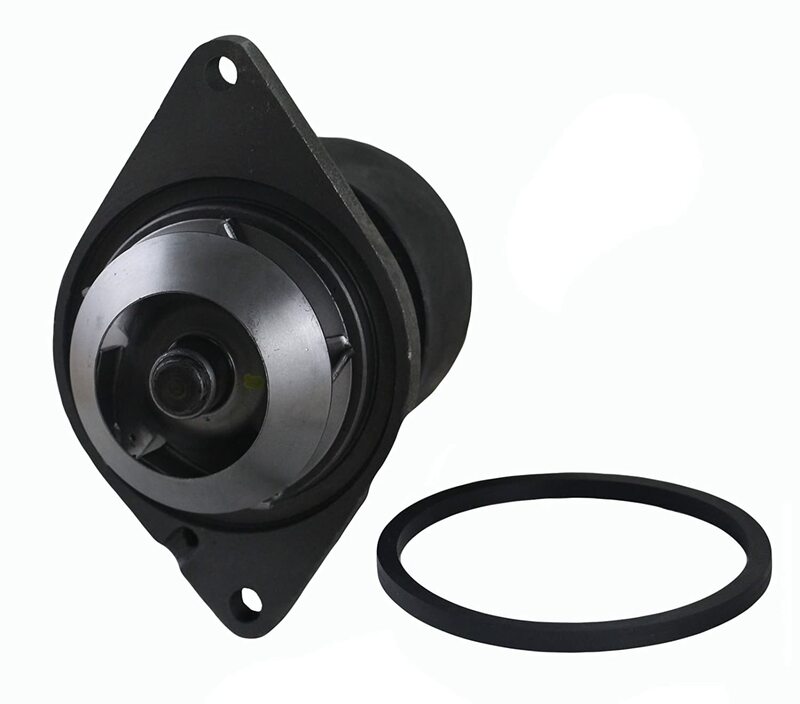 This is a standard OEM quality aftermarket water pump that comes in an iron cast body with a steel cast impeller. The unit is for 6B motors only 1989-1998 models. This is the classic OEM style 6BT water pump replacement part, very budget friendly and extremely reliable. Replacing a water pump is about 20 minutes of work, and maybe another 10 minutes to check your pressure. I attach a comprehensive video as well as explain in text. Wipe the engine surface area, don’t score it. Restore the belt back into place. Input new water and coolant. Start the engine and you are all done. The 5.9 Cummins was the preferred engine in Dodge Ram pickups till 2007.5 when it was replaced by the Cummins 6.7L engine. The Cummins 5.9L ISB has gone through some changes since it was first introduced in 1989, and there were three generations of this motor. Generation 1: 1989-1993, 5.9L (359 in3) inline 6-cylinder, 4-stroke, Turbocharged / Aftercooled (MY91.5+) delivered 160HP @ 400 tq, VE-Rotary pump, 12V valves. Water pumps are integral key components in a cars engine performance; they maintain the temperature of the engine by pumping coolant around the engine block, hoses, and radiator. 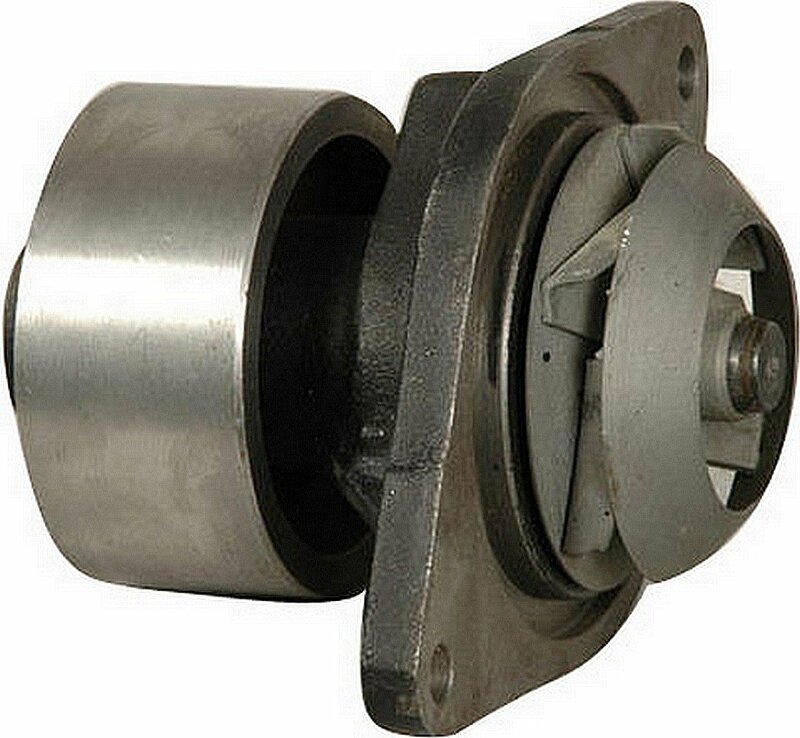 The water pump uses an impeller that is driven by a serpentine belt from the crankshaft pulley. The impeller pumps the water constantly through the engines water jacket that is constructed around the combustion chambers. This constant flow of water maintains the core temperatures from overheating. The water flows through the engine and heats up as it goes through, it then passes through the radiator that is cooled by the air flow and returns to the water pump for reflow into the engine block once again. This is a very basic circular pumping motion, with its simplicity comes the most cost-effective cooling agent for the engine. Even while the actual water pump is a very basic device, it does have issues as with all electromechanical units. Worn bearings, these are discovered when you hear a grinding noise and are usually a sign to replace the whole unit. Sometimes you can replace the bearings, but the cost involved is usually equaled that of just replacing the entire pump component. A water leak originating from the pump housing is a sign that either a gasket or the shaft seal is cracked. Water leaks reduce the effectivity of the pump to push the water and thus lead to overheated engines. When you see your water temperature light turn on, you need to check for a leak in the entire system, including the pump housing. The two variants of a leaking pump housing are different when a shaft seal cracks you need to replace the entire water pump when the gasket cracks you only need to replace the gasket. Broken impeller blades are a more modern occurring problem with water pumps that are made using plastic impellers. You will notice a vibration originating from the pump housing, and a broken blade will lead to a pump fail and an overheating engine. In this case, just replace the entire pump. A water pump is a very simple device; it can be maintained with a minimum of effort. To start off with, if you intend to change the OEM unit, make sure you only purchase a brand pump made from good solid metals. Always make sure the amount of coolant and antifreeze is per manufacturers ratios. The coolant acts as a rust inhibitor, and the anti-freeze is only added for cold (minus degree) weather. Turbos for 5.9 Cummins – Buyer’s Guide! Clutches for Dodge Cummins – Buyer’s Guide!